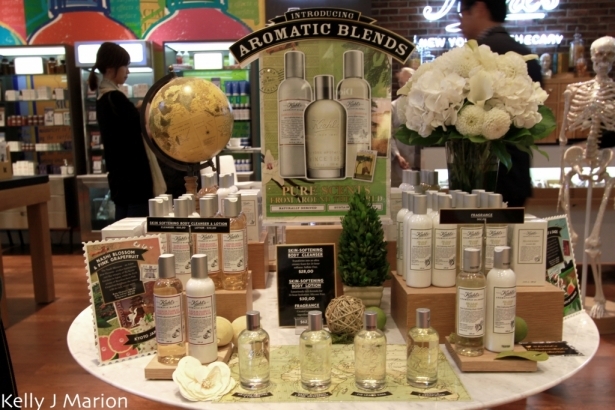 New York based apothecary, Kiehl's, opened their flagship location in The Hudson's Bay Company on Tuesday. The "shop-in-shop" has a welcoming and funky vibe that is a stand out from the other skin care and beauty products surrounding it. 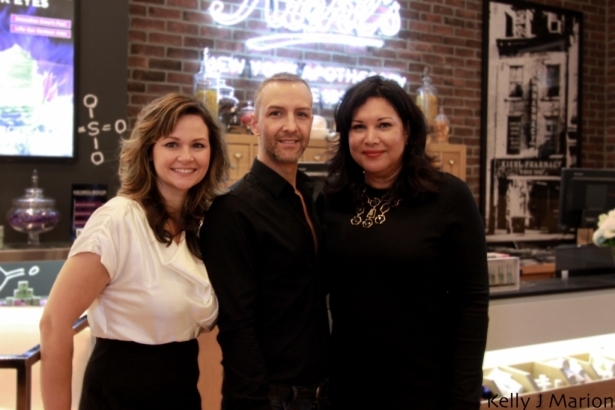 Cammie Cannella, vice president of worldwide education at Kiehl’s explained the look of the new shop. 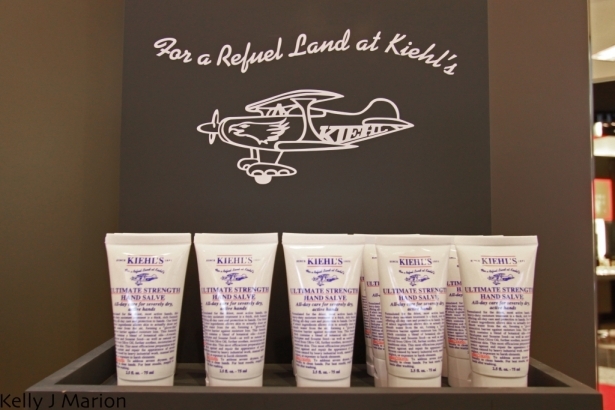 Kiehl's for us is an experience. 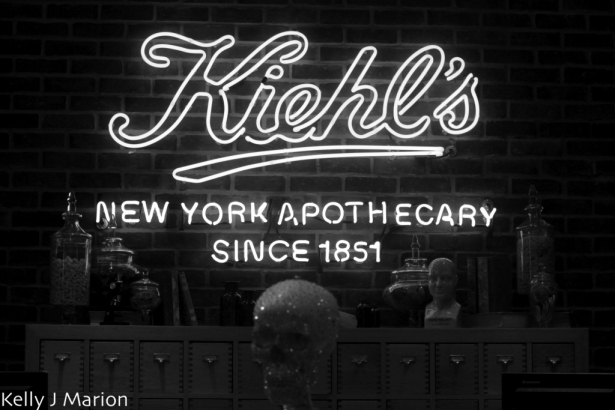 We feel that anyone who visits any Kiehl's store around the world should have the same look and feel that you would get if you were to come to our original pharmacy back in 1851. 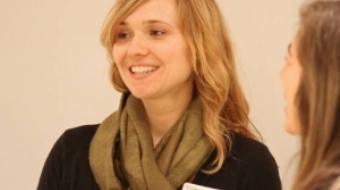 Beyond the experience it is ultimately about the product. 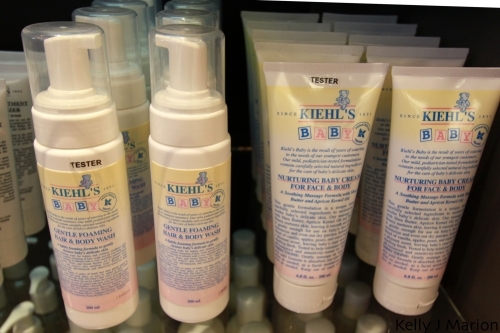 Kieh's skin care and beauty products are naturally derived and relatively priced - both important things to Vancouver shoppers. They even use simple, efficient, and recyclable packaging in order to concentrate their efforts and costs on the substance and quality of the product. 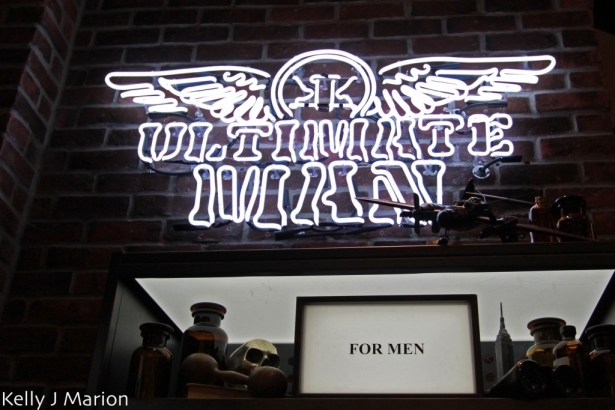 And their products aren't just for women, they even carry a wide range of items for men, pets and babies. 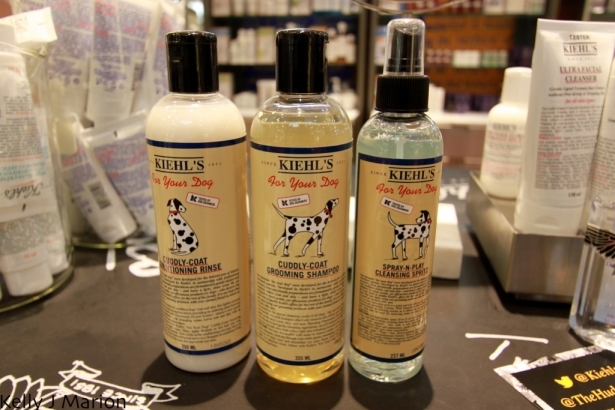 The launch party on Tuesday brought out shoppers, bloggers, media and staff, who packed into the eye-catching new space to peruse Kiehl's goodies, drink cappuccino's and snack on breakfast appetizers. 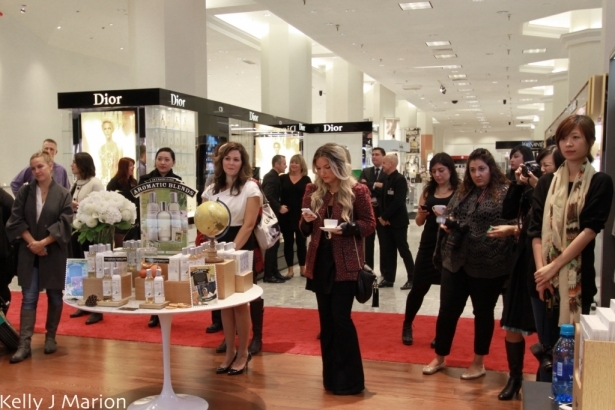 Many were there eager to mingle with renowned Vancouver fashion designer Jason Matlo, who created limited-edition T-shirts for Kiehl's. Since he is a self-proclaimed "black-a-holic" his shirts are black with a bold, sparkling Mr. Bones on the front. 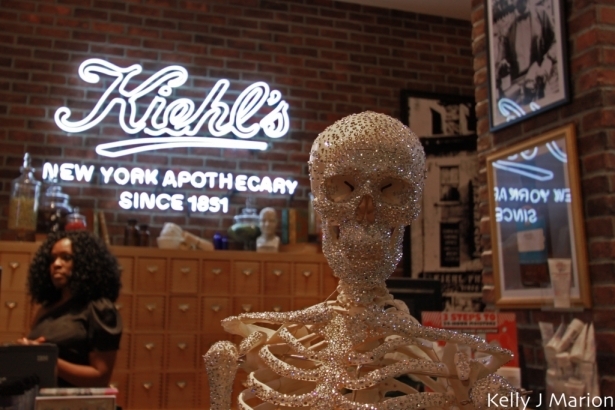 Mr. Bones is a heritage element of Kiehl's who started off at the original pharmacy as an educational tool used to teach about the human body. When Jason discovered that Mr. Bones would be a component of the design, he was excited as he has had a "lifetime obsession with skeletons and skulls". He merged that with the luxury and excellence of Kiehl's and the branding of The Bay as a brazen, new, exciting department store, to create the final design of the shirt -- the diamond skull. All proceeds from the sale of his tees will be donated to Camp Goodtimes, an internationally recognized program offering a medically supervised, fun and recreational experience for children with cancer. "I like to align my brand with other companies and other brands that have similar mission statements and goals," explained Jason. Their three keystone causes are the same as mine: environment, genes research and children. It felt like a really symbitoic fit, especially since I'm already in The Bay family." Shelley Rozenwald, Chief Beauty Adventurer of The Hudson's Bay Company, expressed her thoughts on Kiehl's joining The Bay. "This brand is so amazing, it has great heritage and great values. 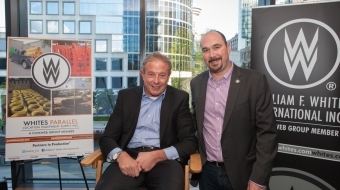 We are so proud and are really excited for the partnership that we've formed." 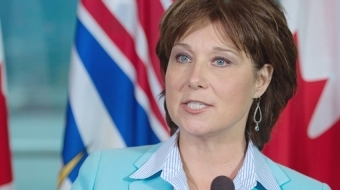 Kiehl’s "shop-in-shops" will reportedly expand to other Bay locations across Canada, but details of where and when have yet to be disclosed. For more information on Kiehl's products check out their website, visit them in The Bay or follow them on Twitter at @KiehlsCa. For more pics from the launch party check out my Kiehl's set on Flickr.